Our undergraduate programs are grounded in the philosophy that good theatre artists are thinking theatre artists. KU Theatre is part of the School of the Arts within the College of Liberal Arts and Sciences. Our students work intensively on acquiring theatre skills and knowledge in our classrooms, studios, and laboratories. They receive small-school individual attention while benefiting from big-school academic choices and vast array of programs. KU theatre students often undertake secondary study in areas such as business, journalism, art, and English. KU Theatre is internationally recognized for its graduate education. Our M.A. and Ph.D. programs are unique for combining intensive study of theatre and performance with the production training necessary for theatre careers in higher education. Our groundbreaking M.F.A. in Scenography is unique for having an integrated approach to scenic, lighting, and costume design that prepares artists for professional and academic careers. The classroom meets the stage in the University Theatre, a leading arts program serving the KU and Lawrence communities. KU Theatre students, faculty and professional staff work together to create up to eight fully-produced shows each year, from dramas to musicals to opera. In our fully-equipped facilities students engage in all aspects of production onstage and backstage. Production continues year round with the summer Kansas Repertory Theatre program. The Theatre faculty are creative artists and researchers working in the areas of theatre technology, performance, design, dramatic literature, dramaturgy, pedagogy, as well as the historical, literary, and cultural study of theatre and performance. Our faculty include award-winning teachers and internationally recognized scholars and artists working in professional theatre and authoring books and articles. KU Theatre offers students financial aid in the form of dozens of scholarships, awards, and teaching assistantships each year to graduate and undergraduate students. 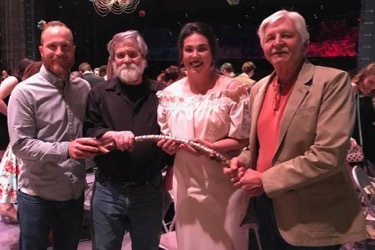 A strong community of support is found in the Friends of the Theatre (FROTH), a community group dedicated to enhancing the mission of the University Theatre. Once students graduate our program they join a wide network of theatre Alumni and Professional Advisors.